Now that the days have gotten longer and the weather is turning to sunny skies, outdoor brunches and trips to the beach are a real possibility again! I don't know about you, but eating and drinking outdoors is SERIOUSLY one of life's biggest pleasures. 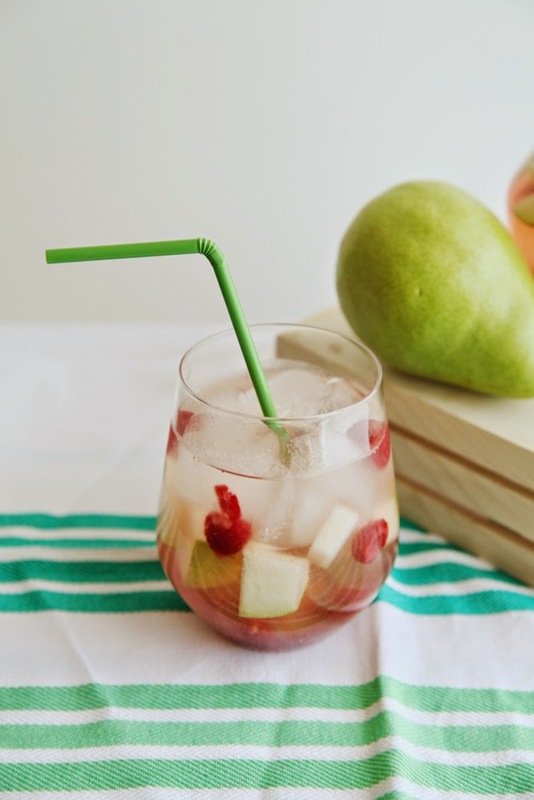 To kick off the season, we decided to put together a cool and refreshing sangria! This sangria is made with Riesling which, like most white wines, tends to have a range from mildly dry to sweet. The bottle I used (Chateau St Michelle) is closer to the dry end of the spectrum since we're adding so much delicious ripe fruit, but don't worry about this too much! Any Riesling wine will work fine. If you can't find a bottle of Riesling, substitute with Sauvignon Blanc, blush wine or even a sparkling wine like Prosecco! 1. Open can and pour syrup into the bottom of a pitcher. 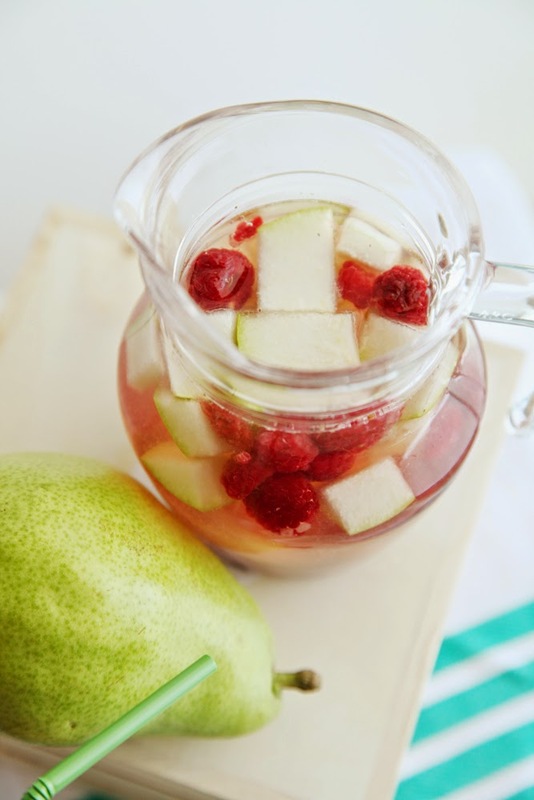 Cut the pear slices into small chunks and add to syrup along with the fresh pear. Stir to combine ingredients. Add entire bottle of wine to this mixture and then chill for several hours. 2. Before serving, add cup of frozen raspberries and stir. Pour over ice and enjoy! Note: If you use a sparkling wine, you won't want to add the wine in Step 1 so that you preserve the bubbles. Prepare the pear mixture as described in Step 1, chilling the pear slices and fresh pear in the syrup only. Once you're ready to serve, pour the very chilled bottle into the mixture and proceed with Step 2.